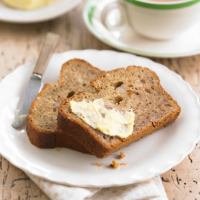 This moist loaf, packed with ripe bananas, sweet honey and chopped nuts, is ideal for afternoon tea. Enjoy spread with butter. Preheat the oven to 180°C, gas mark 4. Lightly grease a 1kg loaf tin and line the base and ends with a long strip of baking parchment. Place the butter, honey, eggs, bananas, cinnamon and flour in a food processor and blend until smooth. Alternatively, beat by hand with a wooden spoon. Add the nuts, and pulse or mix until just combined. Pour the mixture into the prepared tin and smooth the top. Bake for 35-40 minutes until a skewer inserted into the centre of the loaf comes out clean, and the bread is golden and well risen. Allow the loaf to cool in the tin for 10 minutes then turn out. Remove the baking parchment and cut into slices. Delicious served warm or cold, spread with butter. This loaf is a great way to use up over-ripe bananas and will keep for 4-5 days if stored in an airtight container. Try making with other nuts such as pecans or hazelnuts. Serve with a refreshing cup of tea.